If you are celebrating your ninetieth birthday, you deserve to go all out. 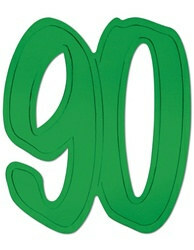 Start decorating with the 90th Foil Silhouettes which you can place on your wall or hang them by a thread from the ceiling. We offer many different decorations specified for your 90th Birthday that matches these 90th Foil Silhouettes such as the 90th Cascade Centerpiece and the 90th Glittered Streamer. You deserve to have a birthday party you will never forget, so go ahead and go all out! Only ten more years to go and you will have lived for an entire century! Really going to look nice for my father-in-laws 90th birthday!